When choosing a central vacuum for your home, pay close attention to the motor housed inside the unit. In your search, you will encounter three styles of motors in central vacuums that determine the quality, power, and life expectancy of the unit. Make sure to ask the salesman to show you the motor and take note of the air flow style. In less expensive models, expect to see a flow through motor. This average motor keeps initial cost down in most cases, but needs replacement every 6-10 years approximately. Flow-through motors do not have a cooling fan, so they use the filtered (semi-dirty) air to keep the temperature down. This system reduces the life of the motor as heated exhaust air enters the motor chamber which leads to debris build up and overheating as time progresses. If you do not mind replacing the motor every so often as they do not cost absurd amounts or do not intend on cleaning often, an inexpensive central vacuum fits well in most small to medium sized homes. Above flow-through motors and seen in a majority of central units, peripheral by-pass motors provide strong suction, feature one to three cooling fans, and last more than double the life of its flow-through counterpart. With at least one cooling on fan on top of the motor, clean air enters the motor and the heated exhaust exists through small vents via side vents on the base of the motor. Manufacturers commonly use two of these motors in dual motor central vacuum systems. 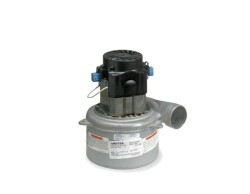 eVacuumStore.com specialists recommend a tangential by-pass central vacuum motor to minimize replacement and guarantee quality. Multiple fans cool the fresh air coming into the motor while it exhausts through a side chassis. If exhausted outside, this design provides 100% filtration of the home. As a side note, if you can, choose aluminum over plastic for the chassis material as this prolongs motor life as well. eVacuumStore.com offers dozens of central vacuum models with the three styles of motor listed above. Call our expert factory trained staff to answer any questions you may have about our selection of central vacuums or their motors to find the right central vacuum for your home and budget. Asthma and allergies are two good reasons why the Oxygen Ultra has a high quality HEPA H13 filter to capture dust and allergens in the air.The unique power head system has a separate motor that drives it, giving Oxygen Ultra maximum cleaning performance. Oxygen Ultra has a durable brush roll and long-life belt to extend the life of the vacuum and leave you with deep cleaned carpets. With the help of the Electrolux Oxygen Ultra's controls on the handle cleaning has never been easier. Height adjustment and variable speed controls allow you even greater ease when moving between carpet and hard floor surfaces. Premium accessories like the hard floor tool, turbo nozzle for cleaning stairs and rugs, power head for cleaning carpets, and on-board tools for above-the-floor cleaning provide all the options for specialized cleaning. The Electrolux Oxygen Ultra can clean almost anything so home can be a haven for a healthy life. Maintaining your vacuum can be simple. Oxygen Ultra has an electronic filter indicator that shows you when it's time to rinse your filter and an electronic bag change indicator that lets you know that it is time to replace your bag. No other canister is easier to maintain than the Oxygen Ultra. There is also a EL6988E deluxe package available, which includes hand held power nozzle, similar to the Side Kick. Top Rated in Consumer Reports!